I write to you today to thank the outgoing 2018 Old Cranbrookians’ Association (OCA) President and Committee and welcome the OCA’s new incoming President and Committee for 2019. Readers of the OC Magazine, received by OCA members in late December, will be aware that Mr Tom Kendall resigned his position, announcing the decision in his President’s Report in that publication. As Headmaster and Patron of the OCA I extend, on behalf of the School, gratitude for Tom’s service to the OCA members, the OCA and Cranbrook School during his tenure. As President of the OCA, Tom Kendall also served on School Council for two years, making an important collaborative contribution to the work of our governing body. We thank Tom for his efforts, achievements and endeavours, and commitment to the OCA from his home town of Wagga Wagga, particularly in the approach to and events of our Centenary year. Of note, Tom was instrumental in the development of the Centenary Website and was the visionary behind the OCA’s Super Reunion and light projection which was held on Hordern Oval in October last year. I also hereby extend our sincere gratitude to the wider OCA Committee who, as volunteers, have also been instrumental in strengthening the traditions of the School. We thank each of you sincerely for your support for the OCA and, by extension, our School. I am advised that the new OCA Committee has now begun its work. Taking up the role of President is Mr Jason Graham-Nye. Jason brings a wealth of Cranbrook connection to the position, having completed his Kindergarten to Year 12 schooling here and worked as a teacher in the Senior School: he is presently the parent of two boys in the Senior School. 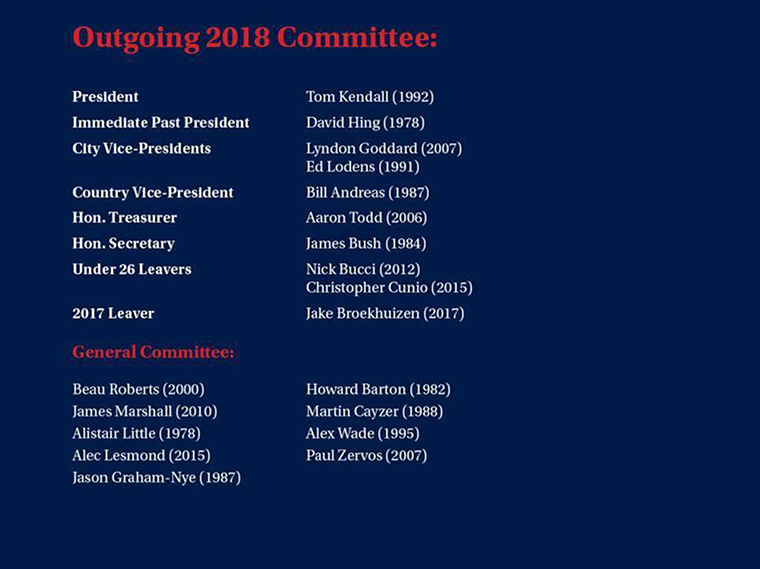 I sincerely congratulate those appointed to the OCA Committee and know that they will serve the organisation and alumni well and work cohesively with the School in support of our second century programmes and ambitions.Whilst the OCA is a separate legal and independent entity to Cranbrook School, we are inextricably linked and, as such, we look forward to working closely with the 2019 President and Committee and wish them well in their leadership roles within their organisation.